Rates are based on occupancy of 2 persons and are subject to change. Only the apartment (up to four guests) and the one bedroom suite (up to 3 guests) can accommodate more than 2. For additional persons above two there is an additional charge of $45.00 to $60.00 per person per night depending upon the season. Please note: If at any time there are more guests staying in any of the rooms then registered at our Provincetown B&B, penalties will apply. No children under 16 unless specifically approved by management. DEPOSITS: A 50% guarantee fee is required at the time of the reservation. Personal checks are accepted on deposits only and must be received within 2 weeks of the booking. Balance is due in full upon arrival and may be in the form of cash, traveler’s checks or credit cards (MC and Visa ONLY). CANCELLATION POLICY: Our Provincetown B&B will gladly refund your deposit, minus a $50.00 service charge for a reservation of 1 to 4 nights and a one night stay on reservations 5 nights or more, as long as we receive your notice of cancellation at least fourteen (14) days prior to the reservation. Should you need to cancel within fourteen (14) days of your reservation, we must rent the room for the entire reserved time or we will be unable to return your deposit. Deposits for Holidays (which include Valentine’s Day, Easter, Memorial Day, July Fourth, Bear Week, Carnival, Labor Day, Columbus Day, Women’s Week, Halloween, Thanksgiving, Christmas and New Years) are non-refundable. NOTE: Early departures are also non-refundable. CHECK-IN: 3:00 PM to 8:00 PM. 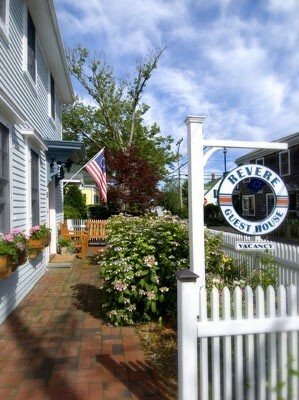 Please contact us in advance for special instructions if you are planning to arrive at our Provincetown B&B after 8 PM. CHECK-OUT: 11:00 AM ($75 surcharge for late checkouts if approved). MINIMUM STAYS: Weekends in May and June (2 nights); Weekends in July and August (4 nights); Weekends in September and October (2 nights); Memorial Day Weekend (4 nights); Fourth of July Holiday (5 nights); Bear Week (5 nights); Carnival Week (5 nights); Labor Day Weekend (4 nights); Columbus Day Weekend (3 nights); Women’s Week (4 nights); New Year’s (2 to 3 nights). PARKING: We have two parking options – however most everything in town is walkable or bikeable – and there is a beach shuttle which takes you to Herring Cove and Race Point. So, we recommend not using your car and enjoying how small the town is. If you need your car during your trip, please see the below offsite parking options. Either parking option needs to be reserved and confirmed, if you do not have a confirmed parking spot from us, you will be required to pay to park in the town parking lots. OPTION 1: Free onsite parking where your car will be blocked in by other cars and we will hold your keys. We will move cars on the checkout date and ensure we can easily return your car to you for your checkout. For Onsite parking, our driveway can only accommodate standard cars and small SUV’s – any large trucks or SUV’s require offsite parking. OPTION 2: Offsite parking – which depends on when you are staying with us. During Season, when town is the busiest, we have a first reserve policy on our limited offsite parking spots. If you do not reserve an offsite parking spot early, one may not be available to you upon arrival. Parking April to October – Paid off-site parking: The off-site parking is approximately four houses away from the guest house and is $10/day. As a comparison, the town parking lot typically charges $15-30/day. There are several town lots near our Provincetown B&B which charge a nominal fee; they are indicated by a large green “P” on the following map link: Map. OUTDOOR FIREPIT: The Spa has been removed from the property to make room for our new firepit. 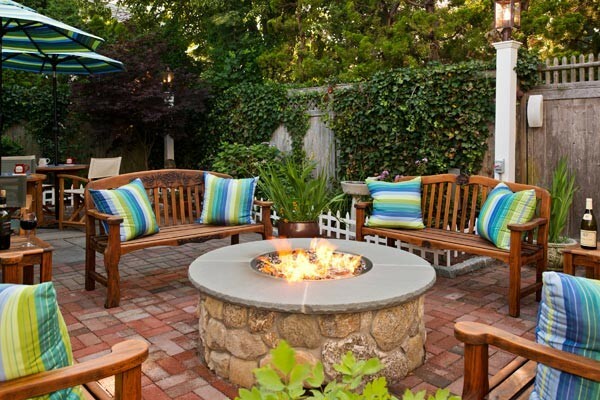 We are in the process of enlarging and updating the back court yard to include the new outdoor gas firepit so that guests my relax around it to enjoy its warmth on those cold evenings in spring, summer or fall. NO SMOKING: For your comfort and ours the Revere House is a SMOKE-FREE establishment (with the exception of the outdoor patio).